I have travelled extensively for studying and photographing wild flowers in the Western Ghats, but this plant alone made me do 10 trips amounting to 10,000 kms to Goa and adjoining areas in the last 10 years for its flowering to be witnessed and documented. I found several plants but not in flowers ever. 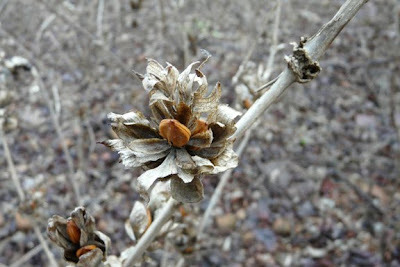 A fruiting plant was shown to me by Dr. Milind Sardesai in Nov. 2007 inside Dajipur WLS near Kolhapur. The sanctuary opens on 1st November and this precious climber flowers just before that. This year I made a reckoning trek inside Dajipur and to my delight found the climber in buds. Of course I had to go back yet again after a week and there was the gorgeous profusion of flowering of this extremely rare climber. 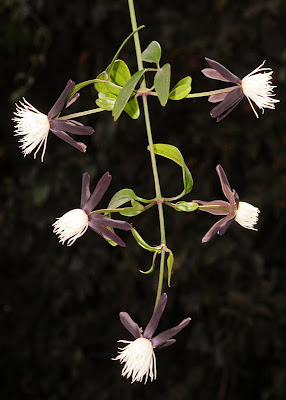 The size, beauty and the divine fragrance of flowers of Clematis smilacifolia surpassed all the disappointment of my earlier trips. This is my submission for the flora picture of the year-2009. inspired to some extent by David Attenborough's "private life of plants" i keep looking for some less noticed structures on the plants which enhance their attraction, used in defense or for any other purpose other than the routine. The leaf is that of Erythrina suberosa. 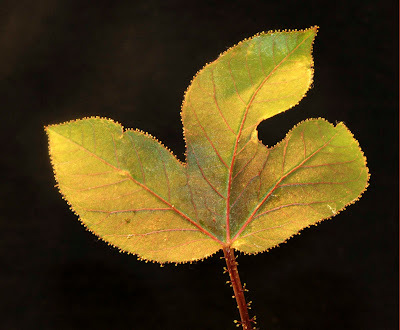 its a young leaf which is almost all covered with a lot of hair. 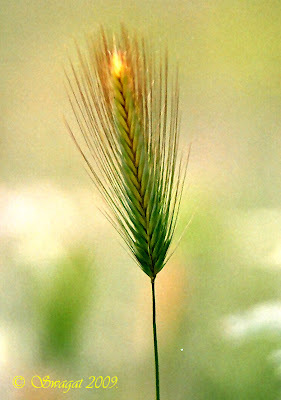 the base of leaf is possesses these extrafloral nectaries which stand out of the hair covering the young parts. 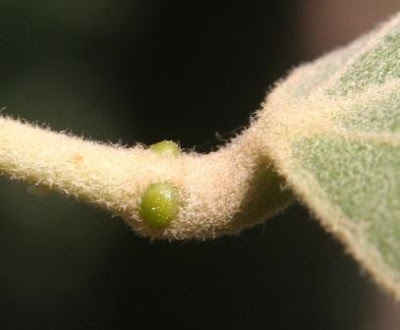 the nectaries probably act in plant defense by attracting ants which feed on the nectar produced by these nectaries. these ants inturn protect the plant, flowers and flower buds from insect pests. highlight in the pic- look like a string of lights. This pic. has special significance for me as it was one of thousands that bloomed en mass at CEC in 2008, the Carvia callosa, after a gap of 8 years. 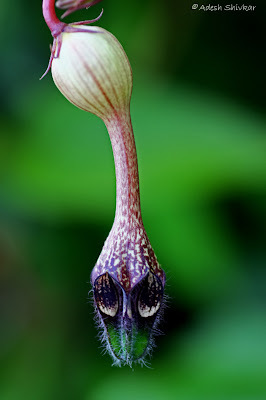 This flower persisted in its dry form for a year, and with the first showers in June, the forest was alive with its "clicking" sound as the seeds absorbed water and catapulted here and there, being its method of dispersal. Indeed, Nature has strange ways for the survival of its many species. Let's hope that in the coming New Year all its creations continue, not only to survive, but to thrive and that we don't have to worry about global warming and climate change any more. This is my favorite flower. For many years i had this flower in my garden, it is self-seeding and so i had these flowers year after year at the same place. It took over one corner in the garden and so i started to use the attractive capsules in dry flower arrangements or give away to my friends. I suppose, one day no capsule was left over to spread the seed in my garden. I was sad, that for a couple of years i had no Jungfer-in-grünen. 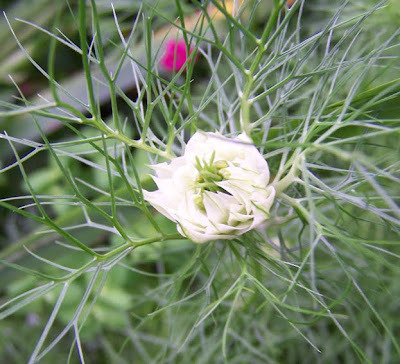 BUT in 2009 there was one plant with a few flowers and it was like meeting an old friend after some years. I hope to get more in 2010. 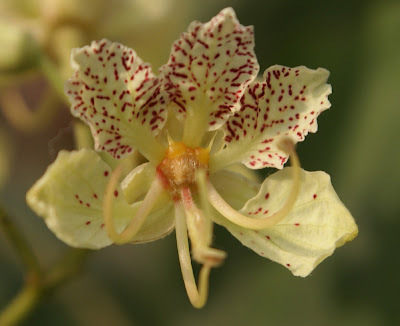 First the tree is very rare in our areaSecond the flowers from a distance look very insignificant, perhaps ugliest in the genus, but only after taking a close up view of the flower I realised that it has one of the best architecture in the genus. My friends don't believe me when I tell them that flower is less than one inch in diameter. Spontaneous reaction of few of my friends after seeing this picture was.... "Hidden Treasure", "Open book" and thats how it looks.. Location: Aakraswadi at the base of Matheran Hill. 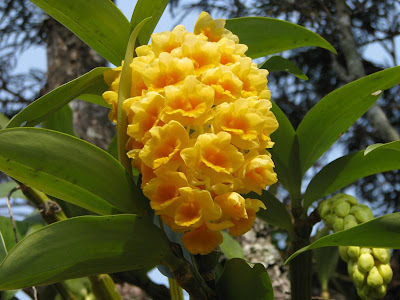 The Pineapple orchid or Dendrobium densiflorum is my flower for the year 2009. It resembles like a full size pineapple. All the buds have opened. I was fascinated by the colour, texture and the shining glossiness which the flower was decorated with. 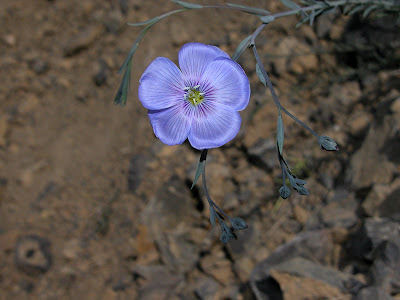 It was surprising to find this beautiful plant in dry barren Cold desert of Spiti valley H.P. Abutilon ranadei Woodr. et. Stapf. I dont think this has not been sent earlier on Indian treepix. This Picture I would like to nominate as flora picture of the year 2009. Photograph taken at Amba Ghat- Kolhapur- Ratnagiri Road from its Type locality on 4th December 2009. This plant is one of memorable in my life because of as i wrote earlier picture was taken from its type locality and another thing is I saw first time this plant in flowering (In Wild). Abutilon ranadei Woodr. et. Stapf. 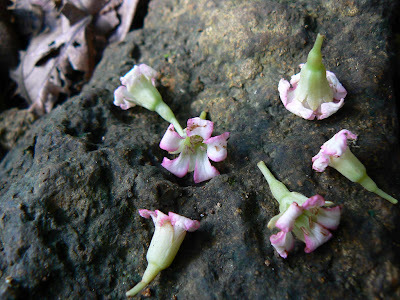 is one of the critically endangered plant species of the Western Ghats in India. 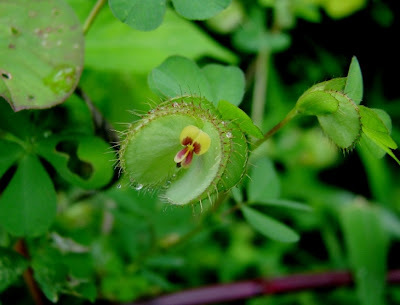 It is Endemic and restricted to four Districts of Maharashtra State. Best Seen At: Amba Ghat region. This endangered species, named after N. B. Ranade, for many years keeper of the Herbarium at the College of Science, Pune, who died of the plague in 1897. Conservation of this species is now initiate in various institutes. it still chases me like a ghost...would chase me, till i get it IDed. 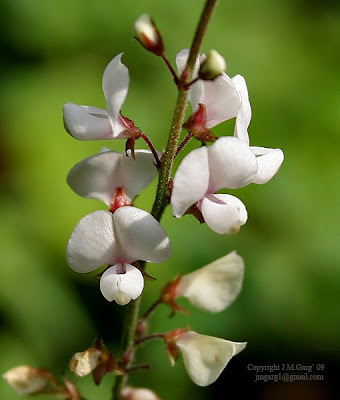 Can't wait for next monsoon, when i would visit Matheran (near Mumbai) again in 2010 same date and same time, to get this flower plucked and show it to seniors in Mumbai/Pune. Place: Kass Plateau, Approx. 25 kms north of Satara, Maharashtra. I have some particularly fond memories related to this flower..... while on a trip to Kaas Plateau, Satara, I chanced upon this flower that was then identified by Late Dr.Shraddha Shimpi (Botany Dept., Pendharkar College, Dombivili) who was our resource person....More than my finding, I was fascinated by the way Shimpi Madam was excited and explained its features and importance with a child like enthusiasm. I was simply amazed not just by her vast knowledge, but by the way she used to explain flora to novices and make it so interesting that many people (I know this for sure) have started appreciating & respecting the floral world.....I owe my interest in flowers to Her. She left for heavenly abode in the year 2009....but her teachings will always inspire and motivate me to inculcate interest in more people about this fascinating floral world. I would dedicate this and all my flora images of 2009 to my teacher - Dr.Shraddha Shimpi. 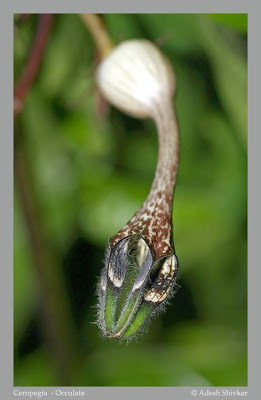 It is photographed in the Botanical Garden of Srinagar, J&K on 3rd August 2009. After lots of trial & errors got this shot. Image is croped & sharpened in photoshop. 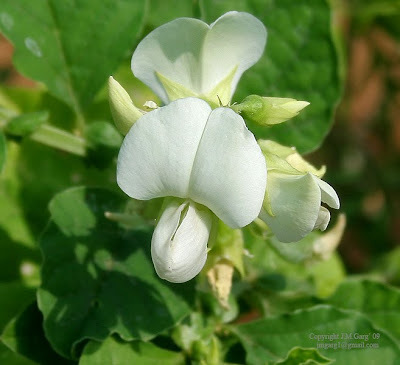 I found the white coloured flowers some of the wild plants are quite rare & more potent. White colour is so pure. It is also one of the most beautiful. This picture is not of any particular plant but this is nature at its beautiful self. So I consider it the Flora picture of the year 2009. This picture was taken on September, 9th 2009 at Hunder, a village in Nubra Valley, Ladakh. This is early morning dew on leaves looking like shining beads or if salt has deposited on leaves. The site was so beautiful with all the plants covered by this mist. As the sun came out these drops disappeared. My flora picture of the year - 2009 - Bauhinia malabarica. Attached is the photo of my first sighting of Malabar Bauhinia on 30 SEP 2007 in Nagla Block of Sanjay Gandhi National Park - rare occurrence in state of Maharashtra. For 2 years, was considering it to be B. thonningii, until Shrikant ji corrected my thoughts !! This year, found trees at two more places: Saphale Ghat and Tungareshwar Wildlife Sanctuary. The problem in raising this tree (Bauhinia X Blakeana) is that one is not sure whether or not it is the same variety. Nurseries often palm off variegaata or acuminata in its place. Anyway now I have it. The other challenge is to convert this bushy tree into a shapely one! People usually think that only branded and costly gift ordered from the online stores, but that’s not the truth. You can now order cakes, gifts online for gifting anyone. Nobody wants a bad gift to be delivered to their loved ones especially in case of perishable items like cake and flowers. online cake and flower delivery in Delhi.